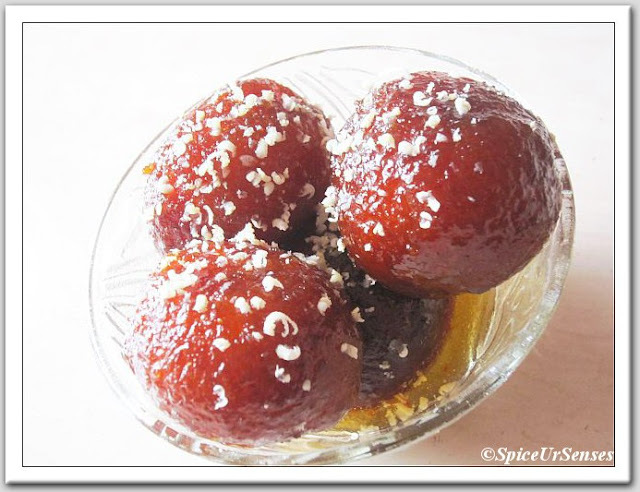 Gulab Jamun is among India's most popular desserts! This delicious dessert consists of dumplings traditionally made of thickened or reduced milk, soaked in rose flavored sugar syrup. It gets its name from two words: Gulab which means rose (for the rose flavored syrup) and Jamun which is a kind of deep purple colored Indian berry (the cooked dumplings are dark brown in colour). 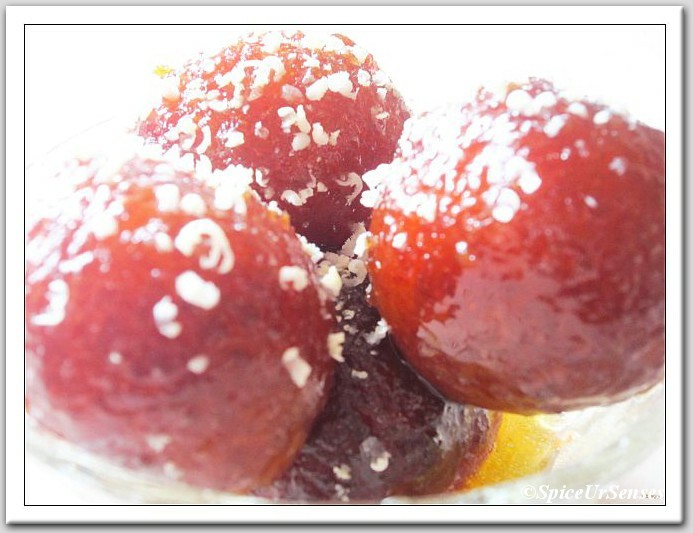 Serve Gulab Jamun warm or at room temperature.. Mix the water and sugar in a deep pan and boil till all the sugar is dissolved. Turn off the flame and add the cardamom powder and rose water. Mix well and keep aside. Mix the powdered milk, all purpose flour and baking powder well. Add a little of the milk at a time to them and knead to make a dough that is soft but not sticky. Divide the dough into walnut sized balls and roll between slightly greased palms till smooth. Heat the oil for deep frying in a wide pan on a low to medium flame. Fry the gulab jamun, stirring often to brown on all sides. Do not cook on very high heat as the gulab jamun will burn on the outside and remain raw inside! truly divine .. too good..
Amazing and delicious dessert. My all time favorite. mmm.... mouth watery and mind blowing. Omg, looks super delectable and irresistible..
My all time favorite dessert. Rumana would u mind if I gobble up 3-4 jamuns from the screen !! 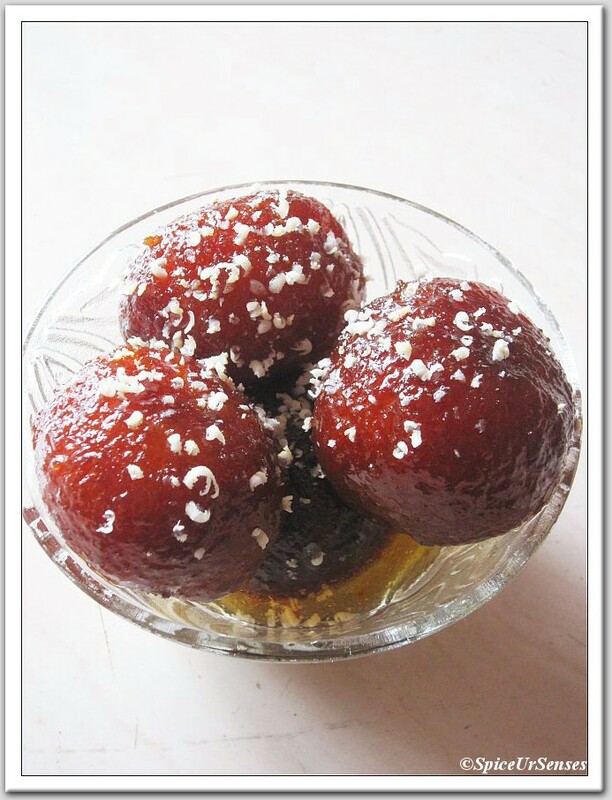 OMG,looks super yummy and perfect gulab jamuns..